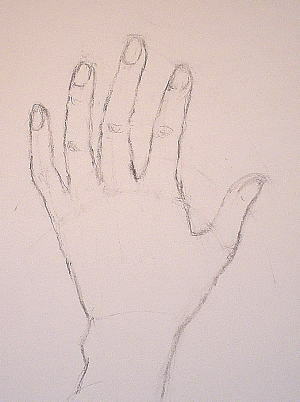 If you want tolearn how to draw hands, then it is absolutely essential to know the anatomy of hands. Like the face, the unique structure of the hand makes it an extremely expressive part of your body. Because of this, hands are pretty challenging to draw well. Think of it: your hand is an intricate arrangement of 19 bones. In comparison, your face, underlined by skull and jaw bone, appears simple. 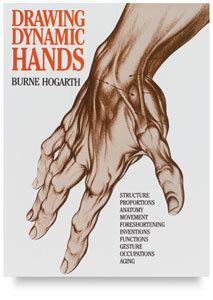 Click here to read a quick review of hand anatomy for artists. When I studied art in Italy, I learned that the best way for an artist to approach anatomy is to simplify the outer form and focus on the underlying structure. You can quickly learn how to draw hands this way. 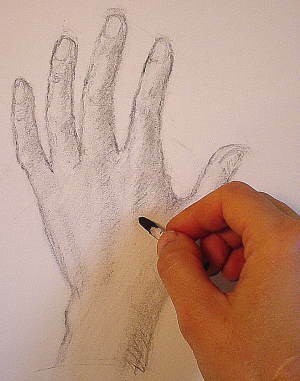 Later on you will take time to fine tune your eyes to perfect your hand drawing, no matter what the position or gesture is. Start with a relatively easy position: a hand held upright with the back of the hand facing you. Once you know what to look for when drawing hands, you will be able to deal with different gestures. Look at the knuckles at the base of your fingers. You will use them as “construction markers” for building the picture of your hand. Notice that the line of the knuckles is curved and that they are unequally spaced. 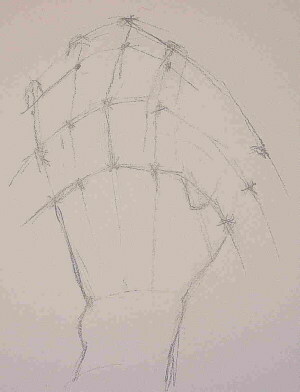 From there, rough out the shape of the back of the palm. Ask yourself what the geometric shape of the palm is and measure its width and length. Note that the palm is not a square. Measure the length of the longest finger in relation to the length of the palm and mark this point on your drawing. Then find the second set of knuckles (next to the base knuckles). Note how they are aligned on a curve. Plot these locations, paying special attention to the overall proportions: how far are they from the end of the longest finger and how close are they to the top of the palm. Yes, as you probably guessed, the next step is to place the third set of knuckles, which are the farthest from the base of the hand. 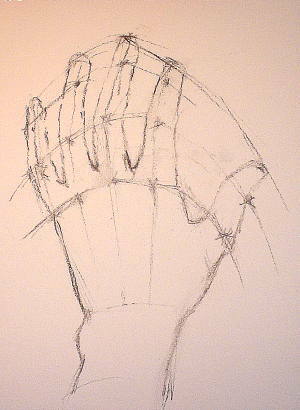 Once again, pay attention to the relationship with the rest of the hand as you draw them. Notice that in this position the thumb can be aligned with the first finger's base and middle knuckles. Now connect the marks you have made to form a basic construct of a hand. 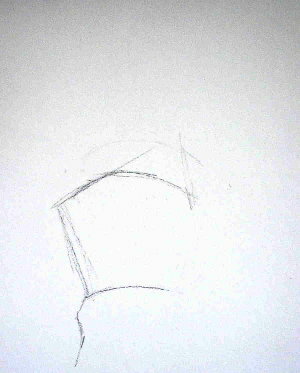 Now move on to draw the contours of the individual fingers—but keep in mind the bone structure underneath. Remember that if you are drawing a bony hand, the knuckles will be more pronounced than a meaty hand. Also remember that the back of the fingers are less fleshy than the front side. 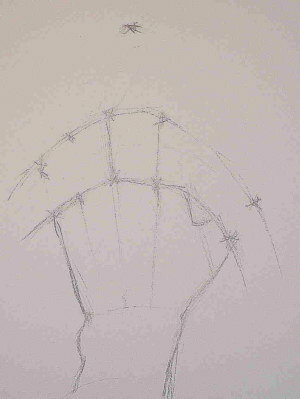 Use convex lines to draw the contours of each individual fingers. Even seemingly straight lines that you see on the hand are not really straight. Use a series of slightly curved lines to construct “straight” lines; otherwise your hand will look emaciated. Now add some shading—identify where the light is coming from before you start. To make your hand believable, indicate veins, ligaments, and knuckles by playing with the tones. Indicate where the finger nails are but never overstate them to avoid a stiff look. Your finger nails follow the cylindrical finger shape, so avoid the temptation to draw cubes or squares to represent them. Now you have learned how to draw hands-the simply way. Are you impressed with the result? Practice the basic “connect the knuckles” method many times to get good at it. Yes, you can draw beautiful hands.